Register Log In wirral forums Forums Local News More Council Loans! Local council elections are coming up next month. Vote the buggers out. It would be nice if there was a viable alternative to vote for. Let us make absolutely sure that no case in favour f these loans appears, either in the Wirral Globe or here! One of the most compelling is that a council is a more trustworthy creditor than a bank, and quite possibly pays more interest. The problem is that the Council is also borrowing money at huge interest rates. 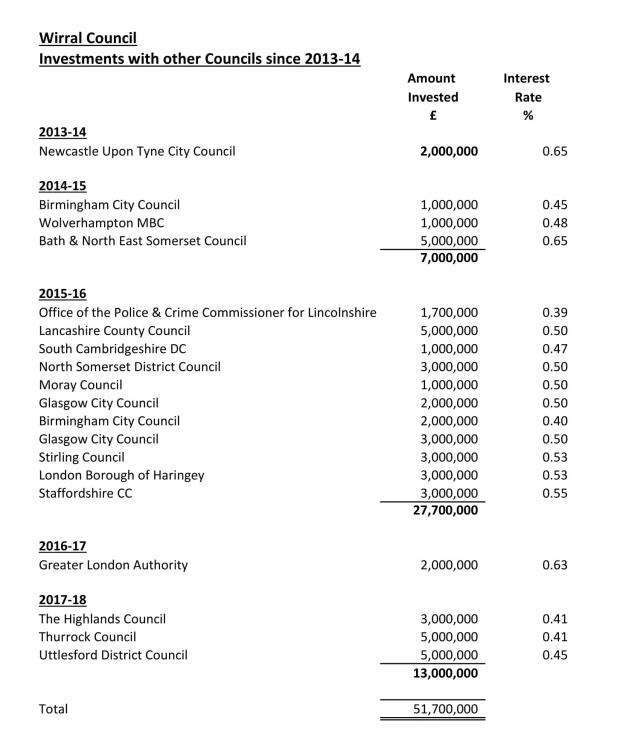 Would be interesting to know the political flavours at the time, of the councils who were the receiving cheap loans. Do other councils loan out their money? If the council is to have reserves of money then maybe other councils are safer bets than some banks and at least the money is helping each other out and not being used to fund bonus payments to bank directors. It may be marked as reserves but it doesn't negate that they are borrowing money at a much greater rate of interest (6%) than they are lending money out at (less than 1%), it is just throwing money away. I've said it before, if the Council wants to lend out money, bring back the Council loans and mortgages which for many years were charged at 6%, that way the Wirral residents can borrow money from the Council and the money isn't "lost" elsewhere. Mind you the Council think nothing of giving themselves pay rises of 16% to 36%, the people need to bring them to account. The amount of money Councillors get given for what is a voluntary role is disgusting and attracts professional politicians who could struggle to get paid for the lack of skills elsewhere. Of course we now have the Council, the Chamber of Commerce and the Business Improvement Districts working hand in pocket with each other now, rate-payers are just an inconvenience.